Postgarten is located in the small town of Herrsching on the east of Ammersee and is part of a hotel and restaurant named Gasthof zur Post (not to be mixed up with SeePost in Schöndorf on the other side of the lake). Gasthof zur Post is one of the oldest buildings in Herrsching and once served as the local post office. The history of Gasthof zur Post dates back to 1456, when it was a manor house and residence of the noble Bavarian family Hundtsberger, who opened a restaurant at this location in 1567. Following several ownership changes, a postal station with stables opened in 1889 with the innkeeper as the manager. In 1902 a telegraph system with a Morse transmitter was installed. The opening of the train track between Herrsching and Munich in 1903 meant the end of the post station. The last postal carriage left in the same year. After further ownership changes, the horse stables were removed, and between 1997 and 2000 the now historically listed building was renovated. Today, Gasthof zur Post offers a small and charming hotel with 17 rooms, restaurant and beer garden. Since May 2012 the Bavarian and Austrian leaseholders Elisabeth and Otmar Walch warmly welcome their guests in the restaurant and beer garden. 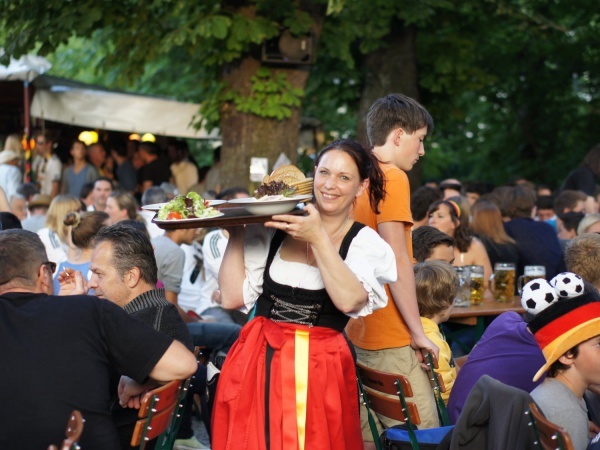 The beer garden has 450 seats in the self-serviced area with a row of ten traditional fixed-to-the-ground tables along the small stream Kienbach. Old chestnut trees provide necessary shade for the entire beer garden. The serviced terrace in front of the hotel building is separated from the beer garden by a small road. Major football tournaments are shown live on a large screen. The food stall of the self-serviced area offers cold and warm meals, such as Wurstsalat (sliced sausage salad), Obatzda (traditional cheese creation), spareribs, burger, Bratwurst and shashlik. The beer served is Augustiner and a Maß Hell (lager) straight out of a wooden barrel costs €6.60 (Mai 6.60). The restaurant kitchen offers a choice of Bavarian and Austrian specialties, such as Bavarian pork roast, pork loin Vienna style, escalope chasseur and cheese spaetzle. Every Friday there is freshly caught Arctic char fried in one piece for €9.99 on offer, and on the weekends suckling pig breast with crispy crust and a 400gr potato dumpling for €9.99. If ordered in advance, the suckling pig breast can also be prepared for take-away. When the weather in nice the beer garden is always open. In case the outside food and beer stall is closed, guests are welcome to fetch their beer from the restaurant. The restaurant is open daily from 10am to midnight, the kitchen is open non-stop from 11am to 22pm. This page was last modified on 18 May 2018, at 19:07.